Balderdash, the classic bluffing game, has gone beyond hilarious. With outrageous questions that now include the category Laughable Laws, play the game that asks your friends to "call your bluff". Each game card lists People, Worlds, Initials, Movies, and Laws that you've probably never heard of. But that's where the fun really begins, because you get to make up an answer that's as silly or as serious as you want! Now mix in the real answer and vote. You score points for guessing correctly and for bluffing the other players. 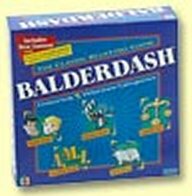 So grab the bull by the horns and play Balderdash, the game tha'ts hilarious beyond belief! This is a game for the creative mind. Everyone is trying to make up the wackiest definition to an obscure word, the most convoluted plot to a movie title, the funniest fit to initials, or the zaniest laws that are actually in the books around the world. This game is great for laughs! Balderdash is a great game to play among good friends, where each person needs to come up with a reasonably plausible (or implausible!) definition for a word that doesn't trigger recognition of the author. It isn't easy to not sound like yourself or apply your own specific knowledge to your bullsh... er, balderdash. This is a great family game suitable for both young and old. It provides lots of laughs and promotes intellectual ingenuity. Can be a little one sided when playing with an English major. Ha-ha. After diving into the "deeper" strategy games, I've found that I have very little patience for "dumb" party games. This is one of the few exceptions; a party game that I still have a blast playing! I should mention that if you can get your hands on the "Beyond Balderdash" version/upgrade of this game, definitely do it!